Trickbox TV supplies broadcast production services for live London wedding. 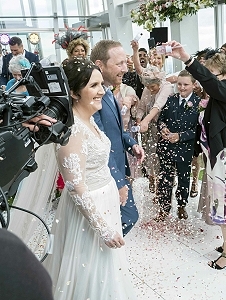 London, August 2017: Trickbox TV - a leading supplier of equipment and services for studio and location multi-camera productions for broadcast, video production, webcasting and live events - has announced that it recently provided a range of outside broadcast services to ITV Daytime for This Morning’s live wedding show. Shot at Europe’s tallest building, The View from the Shard in London, the wedding was granted to a highly deserving couple, Sonya Keating and Paul Brough. It’s the first wedding that The View from the Shard has ever hosted, with the ceremony taking place 800 feet high, on the 72nd floor. Trickbox TV supplied ITV with a multi-camera fly-away solution that included six HD fibre camera channels, and a fly-away control area with positions for the ITV Production team and Trickbox engineers. Trickbox began rigging the show the night before and continued through the night with the first rehearsal taking place at 6am on the morning of the show. The remit included camera fibre cable drops on multiple floors, to allow for quick repos for different sections of the programme.